If you're in the repair industry, you know that warranty claims are inevitable. Faulty parts, incomplete repair or other issues may force an angry customer to bang at your doors. At this time of panic, you are lost in verifying if the warranty is still applicable or not and how to address multiple types of warranty issues! But fret not! RepairDesk is here to help and make your life easy. This is why we have redesigned our warranty functionality. 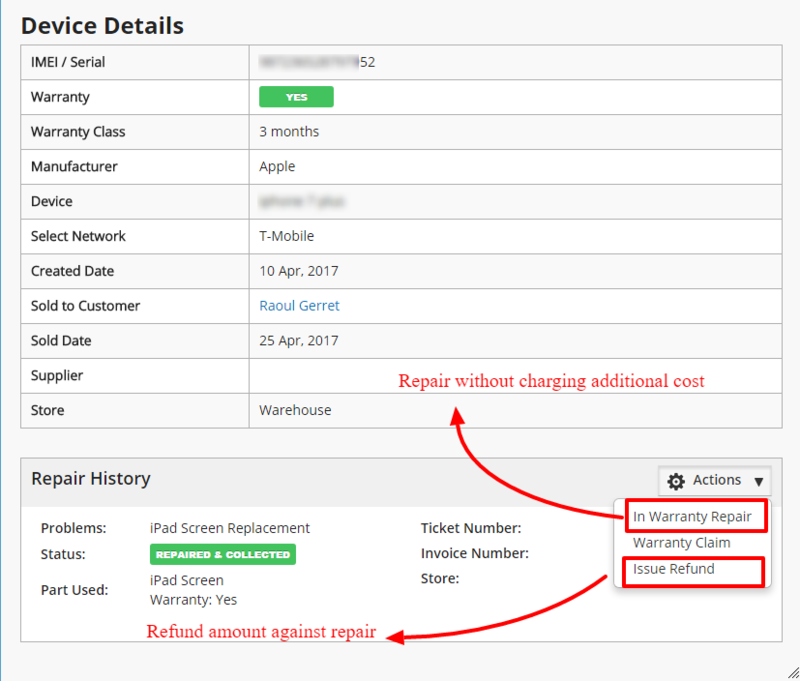 Now you can add warranty on all repair services by default so that when a customer comes back during warranty period, you can quickly perform warranty repair and ticket history is updated accordingly. 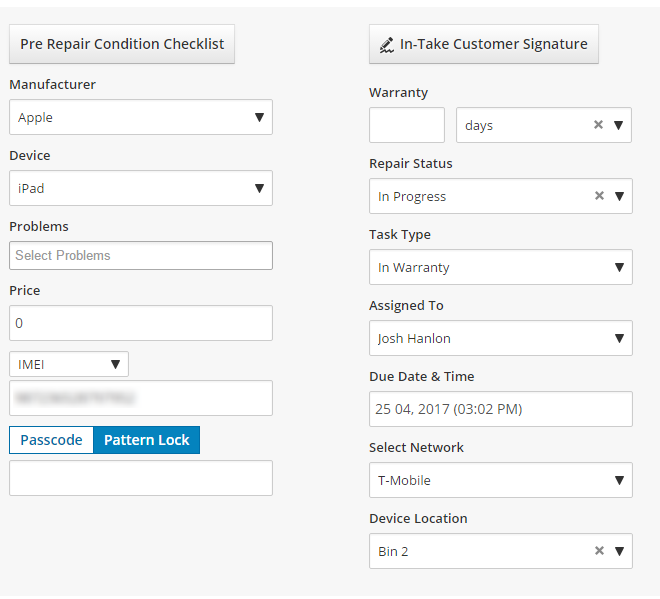 You can set warranty against the repair services which you offer in RepairDesk. 5 Under Product Info tab, set warranty against repair service. You can also set default warranty for all repair services. However, if a repair service has its warranty set independently then it would override the default warranty applicable to all repair services. 2. 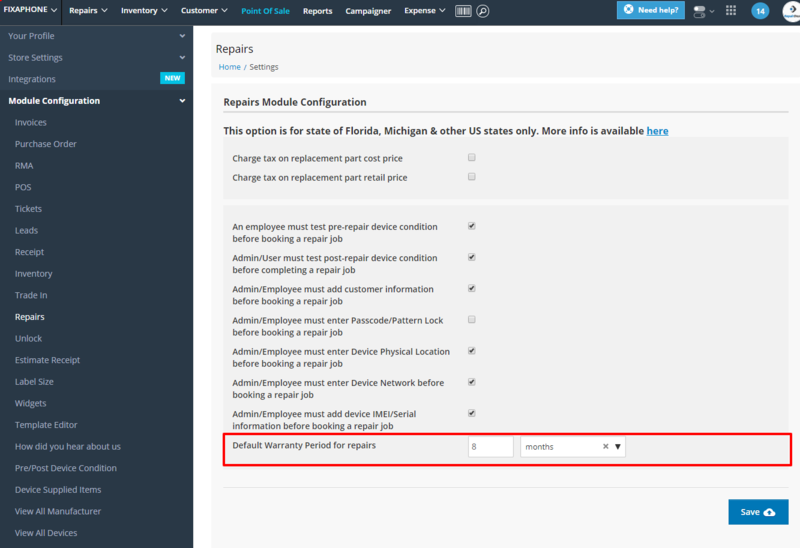 Click on Module Configuration and select Repairs from the left side menu. 3. Under the option "Default Warranty Period for Repairs", select warranty period. In one field enter warranty period and from the drop-down menu, select days, months or years. 4. Click on Save button to implement changes. 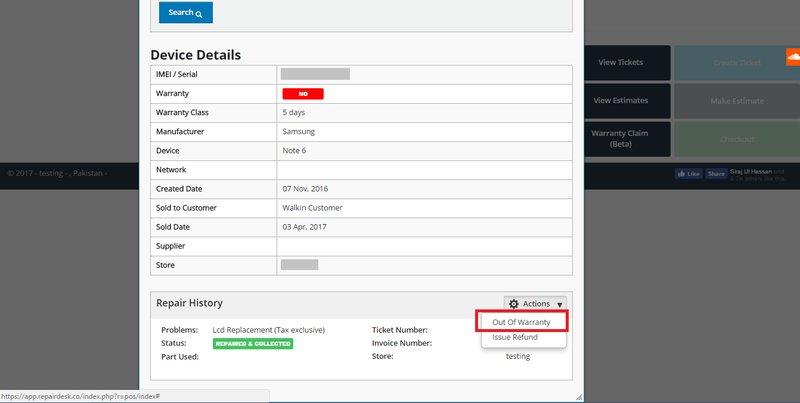 You can also set warranty while creating a repair ticket on the details page of POS. Warranty starts for a repair once its status has been updated to Repaired, Completed or Repaired & Collected. Once status is updated to the following, warranty becomes effective from that day onward. 4. Click on Action button to view options such as In Warranty Repair or Issue Refund. a.) In Warranty Repair - You can offer to repair customer's phone without any additional cost. Note: Created date refer to the date when the repair service was added. 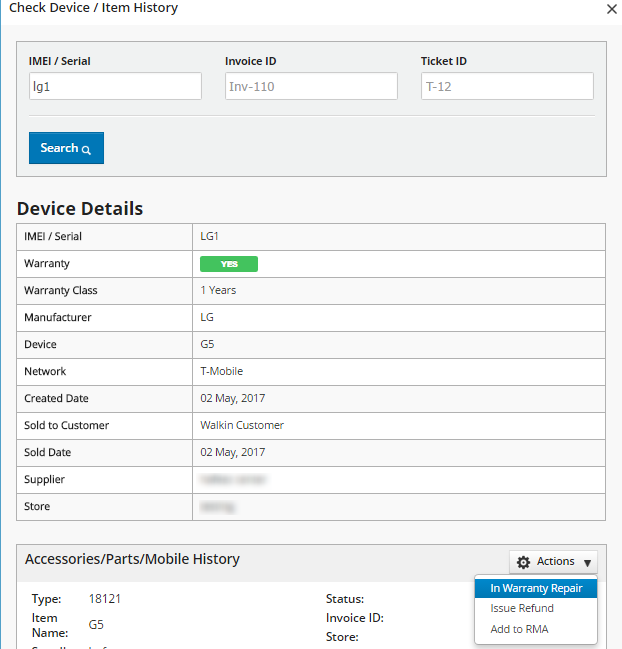 Sold date refers to the date when a repair ticket was create, or a part/ accessory/ mobile was sold to customer. 5. Selecting In Warranty Repair will open the ticket on POS with price automatically set as zero, if warranty is still active. Enter specific details and create a new ticket for this in-warranty repair. 6. If a repair has run out of warranty, clicking on the Action button will display Out of Warranty option. Click on it to create a new repair ticket. This will open the details page while creating a new ticket for the repair job. Note: Please note if its a repair item it will only display repair info, if the repair ticket has been marked as repaired & collected & invoice is marked as paid. 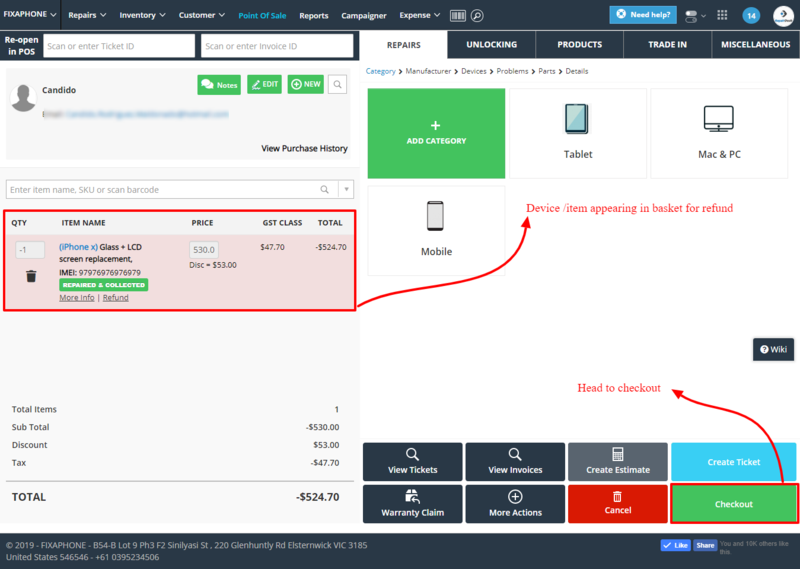 If its an inventory item it will display information if the invoice is marked as paid. A. 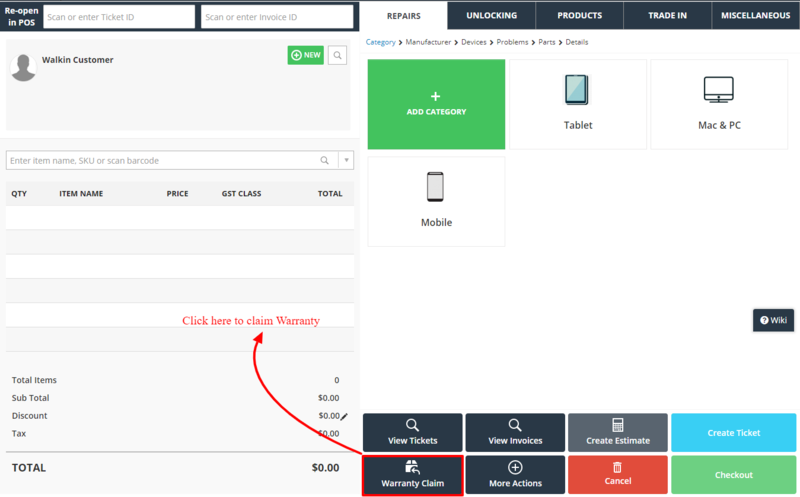 While processing warranty claim for bad parts you can create RMA & print label with a single click. For more information, please click here. Q. How to claim warranty for a repair part? A. Please check this article to know how to claim warranty for a repair part. Q. How to claim warranty for Mobiles and Accessories? A. Warranty claim feature can also be used for Accessories and Mobiles. This is really useful if you sell used mobiles and offer warranty on it or sell brand new mobiles and need to offer 12 months warranty on them. To do so first you need to create serial numbers for accessories or mobiles. You can also specify warranty while creating serials. Once serial numbers are created, you can process warranty for accessories or mobile phones. 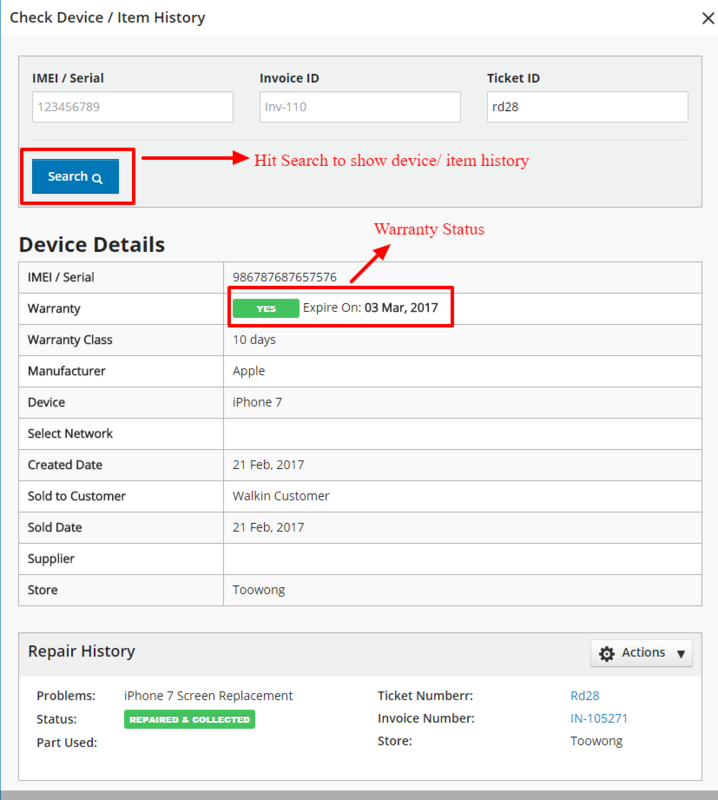 Just click on Warranty Claim button on POS, enter the IMEI or Serial Number and hit Search. 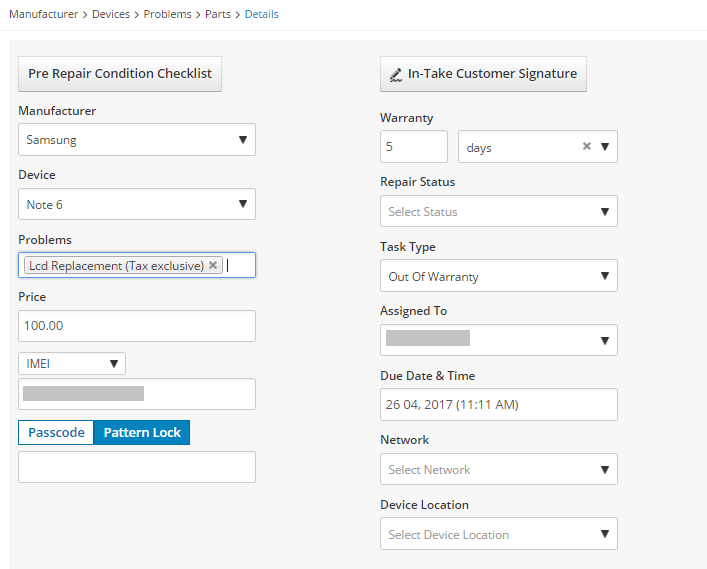 Warranty information for the concerned accessory or mobile will be displayed and you can perform various actions such as in warranty repair or issue refund.